Languages : Hindi, Garwali & English. Temperature : In summer 27 degrees centigrade(max) and 10 degrees centigrade (min).In winter 15 degrees centigrade(max) and 3 degrees centigrade (min). Best Season : March to June,September to November and December to January. 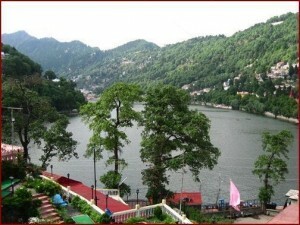 Set around the Naini Lake, at a height of 1938 mt, this charming town ship was discovered by an English a 100 years ago. Graceful weeping willows encircled the lake. Tiny villas and ancient bunglows dot the mountain sides. Poinies, rickshaws and sailboats beckon to discovered the town in its own special way. And as the sun sinks behind the mountains, myriad reflections of twinkling lights transform Nainital into a fairy land by night. 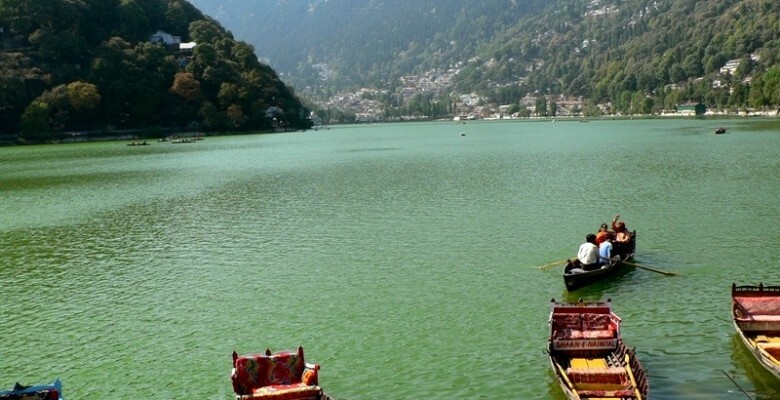 The sapphire-like Nainital Lake, surrounded by densely wooded hills and rich pastureland, the home of the tiger, leopard, ghoral, etc. Air: Nearest airport is Pantanagar 71 km away. Rail: Nearest railhead is Kathgodam 35 km away. 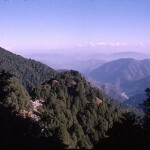 Naina Peak: 5.7 km away from Nainital. 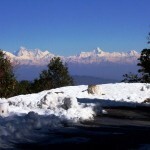 It has panoramic view of the town below and the soaring snow-clad Himalayas in the distance. A log cabin on the tourist department and a restuarant are situated here. The height of the peak is 2601 mts and is also known as Cheena Peak. Dorothy’s seat: Situated at the height of 2290 mts. and 4 km away from Nainital. A memorial to Mrs. Dorothy Kellet built by her husband. Laria Kanta: 5.6 km away from Nainital, the second highest in this area with a fascinating view of all the lakes around Nainital. Bhowali: 11.3 km away from Nainital. A small health resort with an excellent climate. Famous for its apple orchards. Buses are available and tourist bungalow for staying. Hanumangarhi: Located 3.2 km away from Naintal. A beautiful spot from where you can see vivid sunsets on clear days. There is also a temple to the monkey god Hauman. Nearby is the Astronomical observatory and the sattelite tracking center. 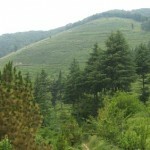 Khurpa Tal: Located 4.8 km away from Naintal. A paradised for anglers. Permists for fishing to be obtained from the District Magistrated, Nainital. Kilbury: Situated at the height of 2528 mts. and 8 km away from Nainital. A lovely picnic spot, or for a weekend visit. Forest rest house provides accommodation. Land’s End: Situated at the height of 2118 mts. and 4 km away from Nainital. It has breathtaking view of the Khurpa Tal on one side and the lush terraced fields on the other. Snow View: Situated at the height of 2270 mts. and 2.4 km away from Nainital. Easily accessible by ropway splended view of the Himalayas. Ram Garh: 25.8 km away from Nainital. 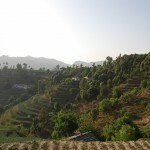 The home of the Kumaon orchards with a lovely view of Himalayas. Buses are available and tourist bungalow for staying. 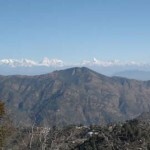 Mukteshwar: 51.5 km away from Nainital. The Indian Veterinary Institute is located here. Accommodation are available at P.W.D. Inspection house and Guest house of the institute. 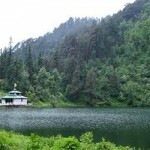 Dodi Tal: Dodital is located at an altitude of 3024 m. Lies down the high mountains with their magnificent snow-clad peaks and tall majestic oak, deodar and rhododendron trees, Dodital is a paradise of tourists. 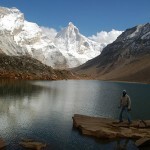 Kedartal: Kedartal is located at a distance of about 17 km from Gangotri. The place serves as a base camp. Kedartal is a place where one forgets himself. 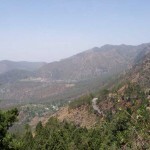 Jeolikot: 17.7 km away from Nainital. Midway on the Nainital-Kathgodam road with orchids and a bee keeping. Accommodation at the P.W.D. Inspection house. This entry was posted in Nainital, Uttaranchal and tagged Bhowali, dehradun nainital, delhi nainital, Dodi Tal, Dorothy’s seat, how to go nainital, how to go to nainital, Jeolikot, Kedartal, Khurpa Tal, Kilbury, Land’s End, Laria Kanta, Mukteshwar, Naina Peak, nainital hill station, nainital kausani, nainital photos, nainital road map, nainital tourism, nainital tours, nainital travel, nainital travel guide, Ram Garh, ranikhet nainital, Snow View, tour nainital, tour of nainital, tour to nainital. Bookmark the permalink.